Last month the stock market had a classic October sell-off. A variety of factors were responsible. Globally there are signs of slowing growth, and rising interest rates in the U.S. are compounding those worried domestically. Consumers depend on cheap credit to buy homes, cars, and many other things, so rising rates act as a brake on economic activity. In addition, although corporate profits were generally good in the third quarter, some large companies have forecast weakening revenue going forward. With stocks at multi-year highs, there was ample dry kindling for a few sparks to cause an October burn. Oil prices fell 10.22% in October as global demand shows signs of weakening and supply expectations have moved up. In particular, the market has been moved by the waivers issued by the U.S. around Iran’s oil exports – basically, the sanctions will not be as robust as initially feared, so suddenly global supply looks a lot stronger. For the year, oil prices are still up about 8%. Gold also sold off in October, by 7.2%, and is up just less than 2% year-to-date. As usually happens when risk assets sell off (stocks, oil, etc. ), the U.S. dollar benefited from demand for a safe haven. The dollar index rose 2.1% in October, and for the year is up 5.44%. The ISM Manufacturing PMI in October was 57.7%, down somewhat from the September reading. The non-manufacturing, or services, index came in at 60.3%, also slightly down from the month before. Still, both numbers are both squarely in the expansion column. The Commerce Department released its advance estimate of economic growth for the third quarter. They estimate that GDP grew at an annual rate of 3.5% - down slightly from the annual rate of 4.2% for the second quarter, but still better than the rate of 2.2% from the first quarter. The National Association of Realtors reports that existing-home sales in September fell by 3.4% from the rate in August, and are 4.1% lower than they were a year ago. The median home price rose 4.2% to $258,100 from a year ago. Median home prices have been rising for the past 79 months. The average 30-year mortgage rate in September was 4.63%, hovering near a 7-year high. Distressed sales (foreclosures and short-sales) were 3% of total sales in September. The stock market sell-off in October made headlines, but I think equally as interesting is the bond market sell-off for 2018. Stocks and bonds usually have some offsetting behavior – one often zigs while the other zags – hence the long term benefits of a diversified portfolio. In other words, bonds are supposed to provide some gains to a diversified investor when their stocks are going down. So what happened in October? 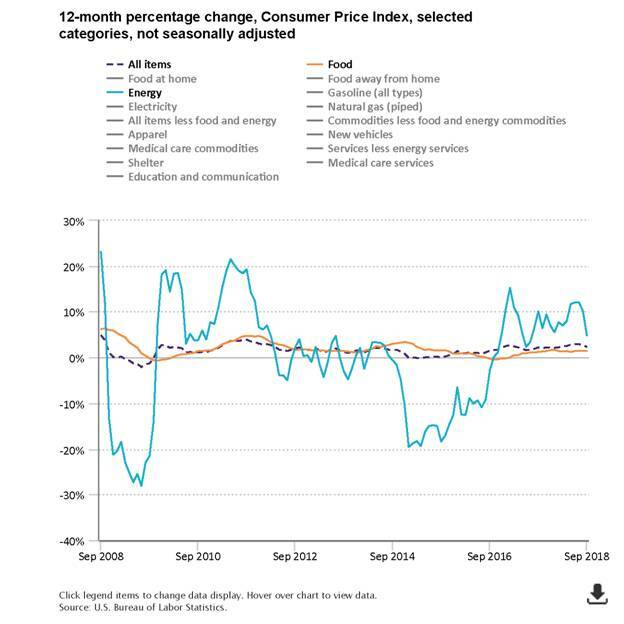 The chart below shows inflation behavior in the U.S. over the past 10 years. The dotted line shows a few things. First and foremost, overall inflation (the dotted line) has remained in the low single digits ever since the crisis of 2008. Despite falling unemployment, wage growth has not been particularly strong, and companies in general have struggled to raise prices significantly. Second, the more volatile moves in energy prices (the blue line) are generally correlated with overall inflation. There is good reason for this – energy prices influence every other price either directly or indirectly. For example, food prices are tied to energy prices. Farming is hugely energy intensive, starting with fertilizers (many of which are petroleum based). Farmers use huge amounts of energy to power their tractors, and also to dry their crops. A global food chain means that much of our food is shipped hundreds or even thousands of miles. When energy prices move up, that directly impacts what we pay at the grocery store or restaurant. The current fed funds rate is 2.25%, and the Fed has signaled that it will rise to 2.5% in December. Arguably these rate increases are designed to keep inflation in check. Inflation in 2016 was 1.3%, in 2017 it was 2.1%, and this year will probably be around 2.2%. The Fed is largely looking at that increasing number, and telling the market that it wants to make sure that 2.2% doesn’t jump to 3% or 4%. However, based on the structural forces that have kept inflation in the low single digits over the last 10 years (demographics and high debt, specifically), it seems that fears of ‘runaway inflation’ are overblown, at least in the near term. In addition, when this period of high energy prices abates (I say ‘when,’ because the nature of commodities is up-and-down cycles), it is possible that inflation will actually fall back towards 1% or 0%. At that point, the Fed funds rate of 2.25% or 2.5% will be quite tight, and the Fed could be forced to cut rates, rather than raise them. In other words, from an inflation standpoint, I think that bond market fears are overblown. There is scant evidence of inflation, other than the fear of inflation. I doubt we will see many more months like October where both bonds and stocks sell off. Either inflation will indeed continue to move up, which should be good news for stocks, or inflation will fall back somewhat, which would be good news for bonds.